Vijay Devarakonda, Rashmika starrer Geetha Govindam is gearing up for its wide release in mid August and the team has begun promoting the film in a big way. Directed by Parasuram, the film has been produced by Bunny Vas. 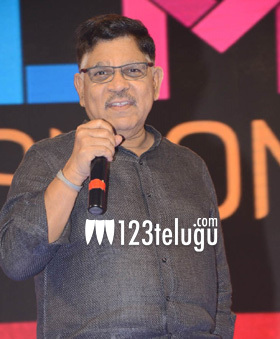 Speaking at the audio launch, Allu Aravind revealed quite a few interesting details about the film. Apparently, Parasuram told him the storyline during the post production of Sreerastu Subhamasthu. “I liked the theme and ensured that Parasuram doesn’t take the story anywhere else. We finally began working on the film after a year, and a week after we started shooting, Arjun Reddy released. We were quite worried about how people will react to Geetha Govindam after Arjun Reddy. However, the entire team took a clear stance to not change a single scene because of Arjun Reddy’s success. That, I think, is a major victory for us,” Allu Aravind said. The ace producer also praised Vijay saying that he admires his straight forward nature. “His attitude has become a trend now. He is a gentleman, and he isn’t the rowdy that he projects himself to be,” Allu Aravind added.